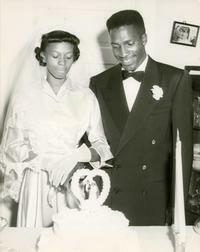 William Ingram was born September 13, 1930 in Pine Level, NC to Pearl Bennett and Robert Ingram. He was the 4th of 10 children and the youngest of the 1st five children. He attended Albuquerque Business College. Elder Ingram later enlisted in the U. S. Army for 3 years, he was transferred to Korea during the Korean Conflict. While dodging bullets and spending countless hours in fox holes, he said to himself, "If I ever reach American soil, I will join a church and be baptized". Elder Ingram was honorably discharged f rom the U.S. Army with the rank of Corporal. In 1953 Elder Ingram married Armanda Bell, the love of his life. From this union three beautiful children were born, Roderick, William, and Ilene. Mother Armanda Ingram was baptized in Jesus name at he age of 10. She then received the Gift of the Holy Ghost at the age of 17. Mother Ingram graduated from Albuquerque High School in 1948. She worked faithfully in the house of the Lord. The Lord blessed her with many talents. She played the piano and was a member of the choir and she also directed the junior choir. Mother Ingram lead devotional service every Sunday. God still had more for her to do. She served a term as the Women's Auxiliary President and theSunday School Secretary in the council. In 1962 Mother Ingram went to Presbyterian School of Practical Nursing and graduated with top honors. Mother Ingram labored for the Lord with all her faith until the Lord called her home in August 2014. In 1965, Elder Ingram and family moved to Roswell, New Mexico. There he pastured his first church, with only hi family and 3 other families. Elder Ingram, applied, and received a job working at Walker Air Force Base Communication Squadron as a teletype operator. Shortly thereafter he and the family was transferred to ENT Air Force Base in Colorado Springs with duties in the Child Building as a teletype operator. Elder Ingram was imperative in being the founding father of Greater Christ Temple Church. In the meantime he held services in his garage. After a time of struggle, the Lord sent a family from Fort Carson who brought encouragement. With the Lord's blessing they were able to move from the garage to a room in the Carpenters Hall building where they worshiped for 6 years until they were blessed with a building on East Boulder street, where they served for quite some time. The church on Boulder began to grow and they were able to pay off the mortgage. As they grew out of the church, Jesus blessed them with the building that we worship in today. Because of his faithfulness, sacrifice, and endurance, the foundation was built. In 1975 he was elevated to District Elder, then in 1994 Elder Ingram went from Elder to Suffragan Bishop and served in that position until December of 2007, when the Lord called him home. In 2008 Elder Reginald Cox became Pastor. The work he started is being carried on, as Bishop Ingram would say "What do you know about Jesus?"